The late twenty-third century — Starfleet’s golden age of exploration. Desperate to stay one step ahead of its rivals, the Federation sends two starships, the scout Sagittarius and the cruiser Endeavour, to plumb the secrets of the vast region known as the Taurus Reach. Drawn by mysterious energy readings to a lush green world, the crew of the Sagittarius find the Tomol: a species whose members all commit ritual suicide just as they reach the cusp of adulthood. The crew of the Sagittarius want to save the Tomol from their cycle of self-destruction, but first they’ll need to save themselves — from the most nefarious Klingon starship commander in history. "Mack is a master of writing action and suspense. … While Mack can write epic, sweeping stories, it is the very human struggles of the characters in his novels that provide the true drama." "An exciting and action-packed beginning to what looks to be an extremely promising new series, this novel earns top marks from me." "As always, Mack flexes some pretty hefty action muscle in Second Nature." "If you're looking for some exciting and thought-provoking fun in the Star Trek universe, David Mack has more than delivered." "Mack is one of those rare but very pleasing science-fiction writers who gets better with every book." "Mack can be counted on to invest even his most workmanlike narratives with smart and often thought-provoking little details, and Second Nature is no exception. There's some fine textured Star Trek work being done in these pages." "If the Vanguard series is any indication, there'll be plenty of such good stuff to come in this Seekers series, although by far the best insider nods going on here are the covers of the books in the series, deliciously retro conceptions by the great Rob Caswell that pay homage to the covers of the old James Blish Star Trek anthology volumes from forty years ago." "David Mack kicks off this new Star Trek literary spin-off series with a multi-layered tale of exploration and discovery. … As ever, Mack handles questions of morality, decisions regarding the prime directive and action scenes with equal aplomb, and demonstrates some nice sleight of hand to misdirect the reader." "Verdict: An enjoyable start with some familiar faces from both the screen and printed Star Trek universe making a reappearance. 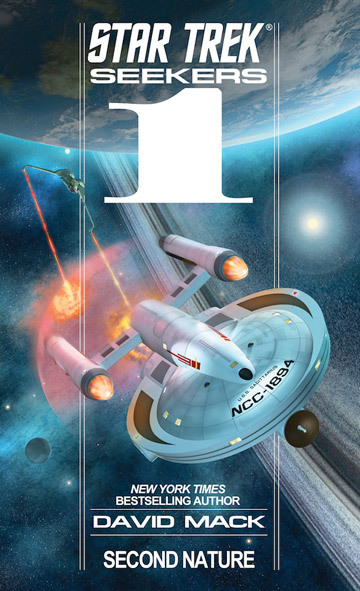 8/10"
"Mack remains one of my favorite Star Trek authors from the last 10 years, carving out a deliciously dramatic story that will have you page-turning into the early hours. Second Nature has every hallmark of an 'epic' in the making, and comes highly recommended. It's a rather auspicious start to the new Seekers series."